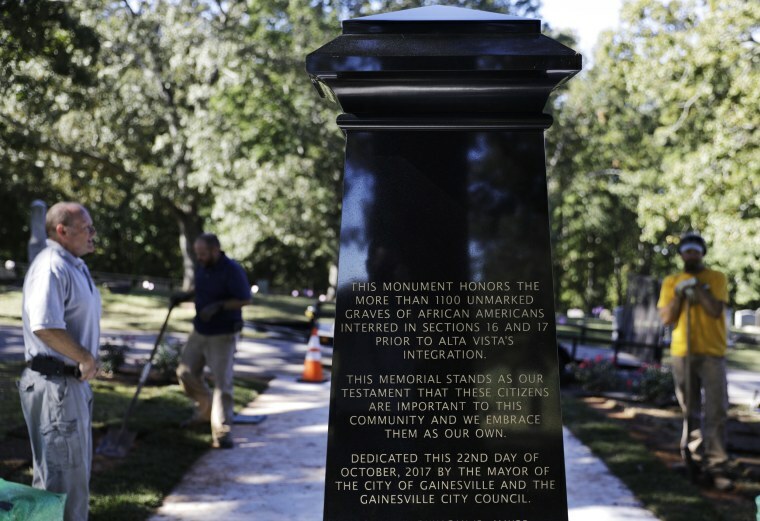 For the small Georgia town of Gainesville, a bleak history of segregation included the open secret that a portion of the Alta Vista Cemetery contained a section of unmarked graves bearing the remains of black residents. Since the 1872 establishment of Alta Vista until the 1950s, 1,146 black bodies were unceremoniously buried in two sections toward the back of the cemetery, according to the Associated Press. On Sunday, locals from the town of about 40,000 gathered to pay tribute to residents who had for so many decades gone unrecognized. At the ceremony, officials and organizers of the event unveiled a seven-foot, black granite obelisk and six benches placed in lieu of headstones to honor the interred. On the obelisk is written, “This memorial stands as our testament that these citizens are important to this community and we embrace them as our own.” During the ceremony, small flags were placed on each gravesite to help the public see them from afar. The decision by officials to publicly recognize those buried in Gainesville's unmarked graves came in 2015, after the racially motivated massacre of nine churchgoers in Charleston, South Carolina. Officials used ground-penetrating radar beginning in 2015 to search for those black residents who were buried without recognition, according to the Associated Press. Initially, investigators found 200 unmarked graves. As the years went by, the number grew to be more than five times that amount, the Associated Press reported. After officials identified the unmarked graves, they placed numbered silver medallions on each gravesite. But community leaders wanted to do something more to promote healing and reconciliation. On Sunday, a committee of mostly black residents unveiled a memorial to commemorate those whose deaths had so long gone unrecognized at Alta Vista. The committee was led by Barbara Brooks, Gainesville's only African-American city council member, who said she has been engaging with community leaders and reporters about the ceremony for the last year and a half. "To me, it's an opportunity to say, 'Okay, we don't know who you were and we don't know when you were here but you're important to us,'" Brooks told NBC News. "Today it was like a great service. I think we put those souls to rest today." Prior to the monuments, some friends, family and loved ones left everyday “markers” — like wooden crosses and rocks — on individual grave sites. “There was a time when people weren’t even allowed to be buried together," Rev. Stuart Higganbotham, a pastor of Grace Episcopal Church in Gainesville, said, according to the Associated Press. "These were human lives." Alta Vista was segregated until the mid-1960s. Though there are no names, ages or birth dates on any of the gravesites memorialized Sunday, they are believed to date from anywhere between the 1870s and the 1950s. "I hope this ceremony today signals to the larger communities all around the state and the nation that it's not necessary to fight. The war is over," Brooks said. "It's time for us to pick up the pieces and move on. I am so proud of my city."